Wireless headphones are the way to go for active people, and Jaybird knows this. 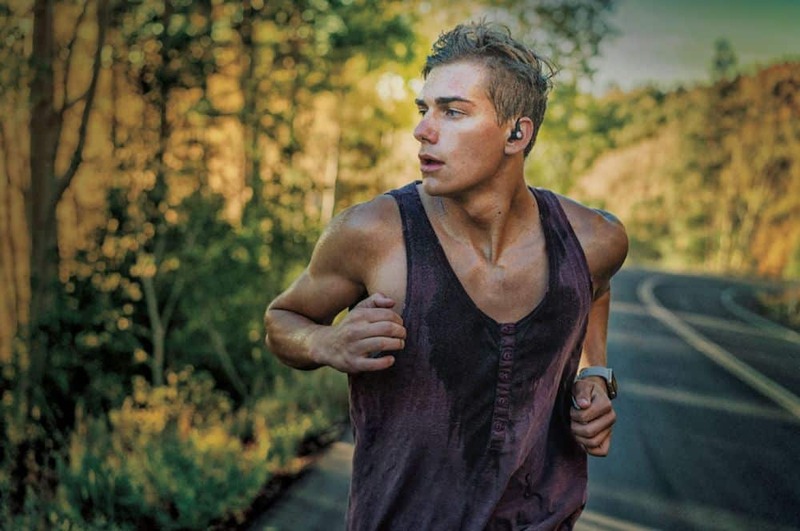 For that reason, they have made the Jaybird Run wireless buds, designed with the active person in mind. Running and hiking are two activities I do regularly, so when we got our hands on a pair recently, we couldn’t wait to try them out. As soon as you open the case, the headphones come roaring to life. By the time you can get them into your ear, they have already connected to your device, ready to go. The headphones come with an ear fin, allowing them to stay in place when things get physical. I found that doing a slight twist on the headphones as you put them in your ears allows the units to properly sit in the ear as it also situates the ear mounts. By now I do it without thinking, and I have found that the headphones stay put when properly placed in the ear. The headphones ship with different ear tips for the best fit, and I found that switching to the larger oval shaped tips made it a better fit for me. Once in place with the right size cushions, the headphones block out a lot of the ambient sounds and really allows the bass in music to come through. The headphones connect through a standard Bluetooth connection, and they were simple to connect. One thing I did note is that pairing requires you to turn off the phones and then hold the power button until the process starts. Once connected, the headphones behaved like I would expect them to do. In my testing, I only had one disconnect, which is on par with other Bluetooth headphones I have used. The majority of the testing was done on two devices, an iPhone, and an iPad. The buds use the Bluetooth 4.1 interface, and they can stay connected up to 33 feet away from the source. The buds support hands-free, headset, A2DP, AVCRP, and SPP profiles. 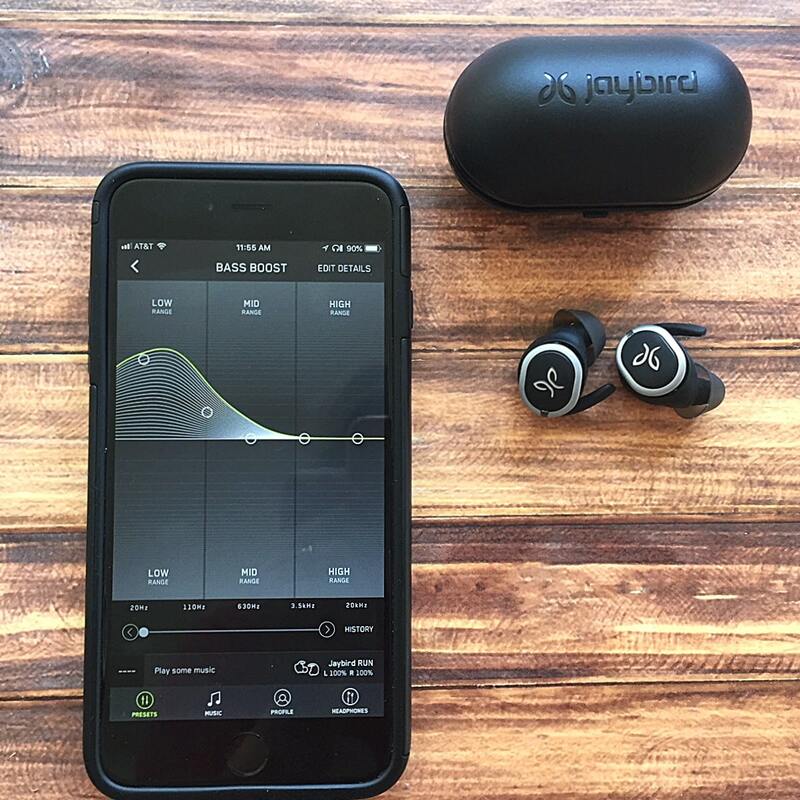 Jaybird has their own app for their headphones, and it allows you to fine tune some of the parameters for audio quality and user controls. The app allows you to define a custom sound profile, boosting bass, midrange, or treble as you want. Once the settings are saved, you do not need the app for the sound changes to stay. The app also allows you to change to an alternate control layout, and will even help you find the buds in the rare case you lose one. The controls are easy to use, and I had no problem adapting to them. In the default configuration, the left earbud summons Siri (on an iPhone) and the right one plays or pauses the music as well as accept and end calls. If you use the alternate controls as selectable by the app, then the left earbud controls volume down, and the right earbud is volume up and answer/end calls. Switching the control layout with the app will restart the headphones. The Jaybird Run headphones delivered a smooth audio experience. As with all earbuds of this type, you do need to make sure that you have the proper size ear tips for your head. If the sound doesn’t sound rich and full, check the fit. The buds ship with different sizes of ear tips, so if there are any doubts experiment for the best fit. The good news is that the Jaybird app has a series of videos to help with the perfect fit. The buds use 6mm drivers to deliver a powerful sound. The phones fit securely and direct the music into your ears for full and uninterrupted audio. If you are running or exercising it’s definitely important to have a good fit. Many of the wireless buds on the market today have an issue with staying properly synced with videos. In my use, I found that the Jaybird Run headphones suffered from the same symptoms. I used both Netflix and Amazon Video for testing with the same results. But it wasn’t bad enough to prohibit the use of the earbuds for video. Maybe I have spent just too much time watching dubbed foreign movies, but it was still quite watchable. Hitting pause for a moment will resync the audio, but it’s really not worth the effort. At its worse, the audio only slightly trails the video. But in all honesty, there is a slight delay. The buds worked well for phone calls. I could quickly answer and converse while remaining physically active. The in-line microphone was capable enough, and I found it was easy to enjoy hands-free calls. This works great while running, too. 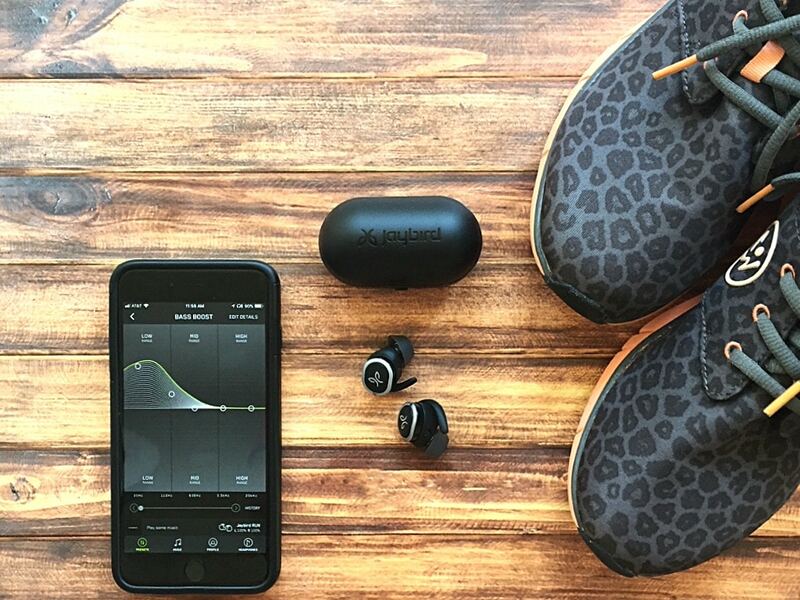 The Jaybird RUN wireless earbuds have enough power storage on board to run for four hours. When they are inserted back into the case, the buds immediately start charging. The case will allow you to charge the buds two times, providing a total listening time of 12 hours before a recharge is needed. The wireless earbuds are designed to be sweatproof and dirtproof, so don’t be afraid to take them with you on your outdoor adventures. In fact, these buds are perfect to keep with you every step of the way, all without the hassle of wires. I found the Jaybird RUN wireless earbuds to be a practical set of buds to use in listening to music. The fit works for me, and the mechanics are easy to use. Perfect for running. The controls are easy to use once you become accustomed to them, and I found that the default configuration worked the best for me. I like that you can customize the sound to your liking, without requiring a specific app to use once it is set. For many users, myself included, the buds will work fine for watching a video with an excellent audio accompaniment on your phone or tablet. But if a slight audio-video sync issue bothers you, I suggest sticking to music instead of watching videos. After all, the buds are named for running. 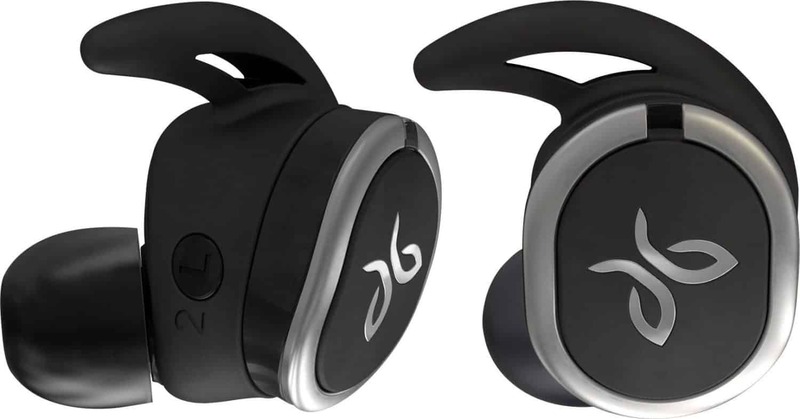 The good news is that you can get the Jaybird RUN wireless headphones at Best Buy on sale right now for $149.99, a savings of $30. They make a great gift for runners, fitness enthusiasts, or for Father’s Day.